Photo from Crushed Out Facebook page. Vocalist-guitarist Frank Hoier and drummer Moselle Spiller released an EP titled Show Pony a few years back when they were performing under the name Boom Chick. Now known as Crushed Out (1920s slang for a jail break), the duo has just released its full-length debut, Want To Give. The 10 raucous tracks blend elements of rock-a-billy, punk, and hard rock into short, catchy blasts that sound like they were recorded live in some bar. That might explain why Hoier and Spiller call their sound, “honky tonk surf rock,” but whatever their reasoning, the results sure are fun. A number of songs have an instrumental intro before Hoier’s androgynous vocals kick in. The raw sounding title track has the feel of vintage rock, and Crushed Out takes a similar approach on “Black And Purple,” which comes across like The Shangri-Las describing a dysfunctional family. The high speed “Temper Tantrum” could be the coolest song about losing one’s cool since Fingerprintz recorded “Temperamental” on their debut in 1979. “Sharkbite” is pretty much an instrumental, save for the disembodied coed vocals buried beneath the hard-charging guitar and drums, while “Push Down And Twist,” with its hand claps and galloping beat, is a perfect party song. The spooky sounding “Miss Mouse” seems to be some sort of offbeat fable, and just to make things even more unusual, “Weigh You Down” has squeaky background vocals. 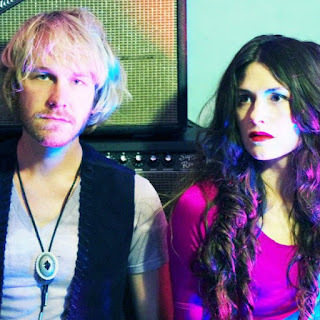 Crushed Out’s website compares them to The Raveonettes, but fans of yet another duo, The White Stripes, are also likely to want to get Want To Give.